Solomon Seal by Margaret Nelson. From the Cape Ann Museum. One of the places I had planned to visit during my month on Boston’s north shore was the Cape Ann Museum. The Cape Ann Museum holds the largest collection of work by the Folly Cove Designers, a group of local designer-artisans who produced stunning lino-cut block prints from 1938-1969. Round Robin by Eleanor Curtis. From the Cape Ann Museum. 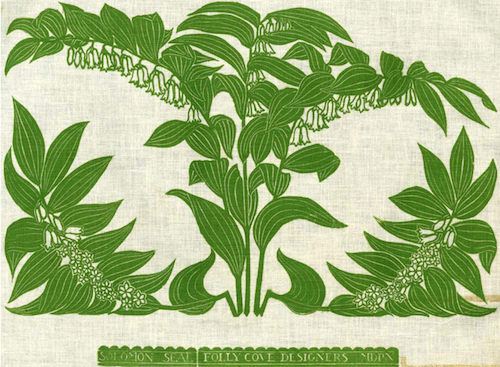 Led by children’s book author and illustrator, Virginia Lee Burton, the Folly Cove designers printed and sold many household textiles like placements, table runners, and napkins. Originals have become quite collectible. Gulls by Lee Kingman Natti. From the Cape Ann Museum. 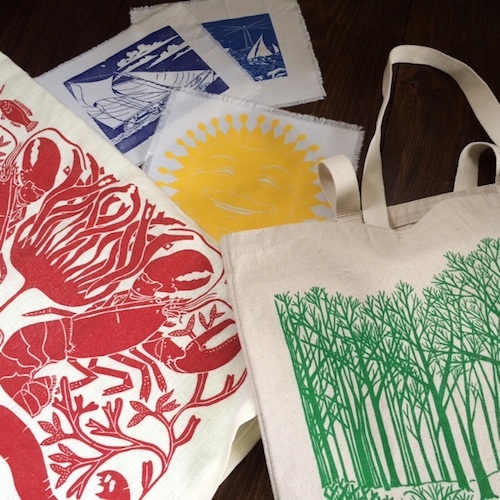 The Folly Cove designers’ work is vibrant and dynamic and filled with inspiration from local nature – New England plants, birds, lighthouses, and fishermen. The balance of design and detail is mesmersizing. Conventional Flower by Louise Kenyon. From the Cape Ann Museum. When I showed up at the Cape Ann Museum, only to discover it closed for renovation until late August, I was disappointed to say the least. But lucky for me, I came across the Sarah Elizabeth Shop, in nearby Rockport. 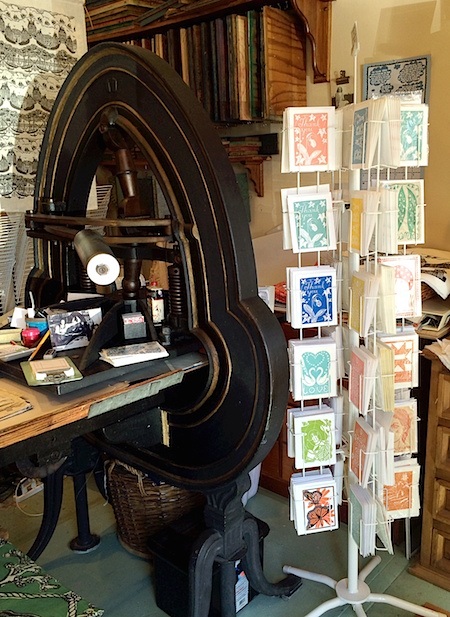 It’s a charming shop packed with locally produced pillows, table runners, placements, cards, and more, all printed with original artwork, using the antique Acorn press used by the Folly Cove designers. Designs range from bold and playful nautical New England themes, to softer, more abstract repeating prints on natural linen. What a thrill it was to peruse all these wonderful prints. 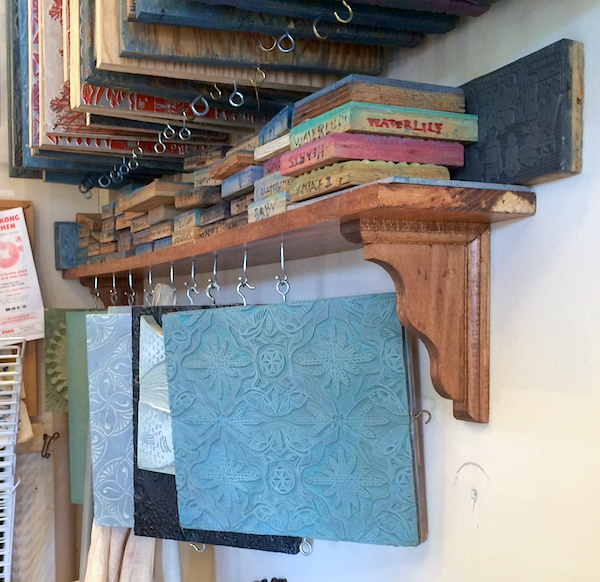 What fun it as to see the linoleum blocks lined up along the wall. Of course I came home with more than a few. If you’re far away and fear you’ll never make it near Rockport, Massachusetts, don’t fret! 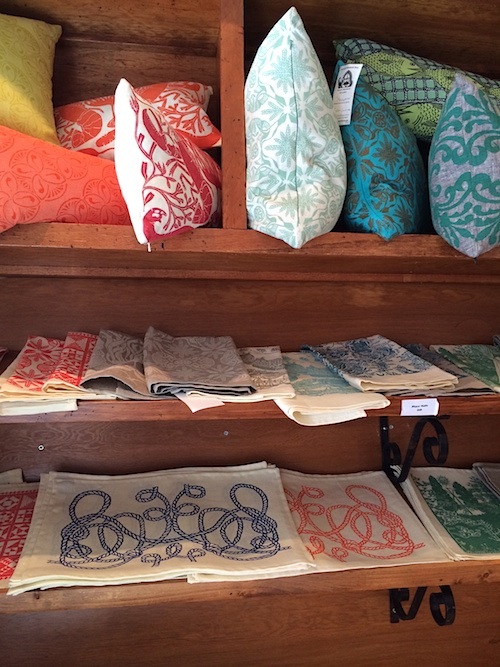 The Sarah Elizabeth shop also sells printed textiles via etsy. 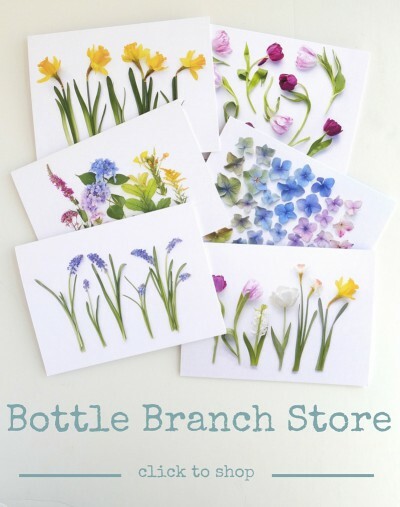 So no matter where you are, you can procure yourself a piece of New England art for the home. How disappointing that you couldn’t visit the museum as you had planned. But that little shop is a great consolation prize. The prints are so beautiful I would have a hard time resisting buying a few. I’m definintely going to have to make a trip to see them in the fall…. luckily its not that far. Thanks for visiting, Martha!